At a recent reading by Per Petterson, my husband I are were the only two people in a large auditorium who had not read the novel Out Stealing Horses; having now read it myself apparently that much later than everyone else, I'm assuming there aren't that many people for whom I risk spoiling the book's plot--for those who are concerned, the theme of most interest to me reveals rather little in the way of traditional plot, even if it represents a central thread of the book's trajectory. 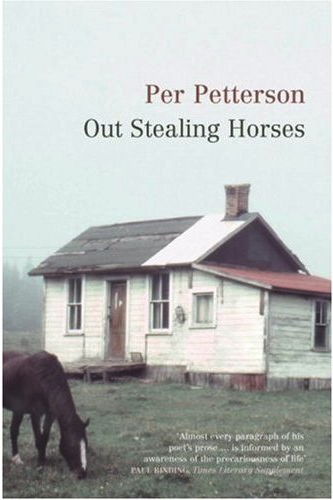 In this story, about the nominally central themes of which I will say nothing else, Petterson does a very nice job attending to the centrality of material practice in human interaction. In three measured passages (at the opening, a third of the way into the story, and again two-thirds of the way through), Out Stealing Horses presents a particular strategy of an inward-turned person who explores the world--in both its domain of symbolic meaning and also its physical manifestation--by mimicking the actions of others, and then figuring out what those actions reveal about what needs to be done. What he had taught me was to be reckless, taught me that if I let myself go, did not slow myself down by thinking too much beforehand I could achieve many things I would never have dreamt possible. I like watching Lars work. I would not call him brisk, but he is systematic and moves more elegantly up to the birch trunk with the heavy saw in his grasp than he does out on the road with Poker. His style infects my style, and that is how it usually is for me; the movement first and then the comprehension, for gradually I realize that the way he bends and moves and sometimes twists around and leans is a logical way of balancing against the supple line between the body's weight and the tug of the chain as it takes hold of the trunk, and all this to give the saw easiest access to the goal with the least possible damage to human body, exposed as it is; one moment strong and unassailable, and then a crash, and suddenly ripped to shreds like a doll can be, and then everything is gone and ruined forever, and I do not know whether he thinks like this, Lars, as he wields the chainsaw with such aplomb. From the depths of a bookish sensibility, it is wonderful to have such moments of bodily awareness, and such sociality of being materially in the world, with and through others. Per Petterson (2003/2007). Out Stealing Horses. Minneapolis: Graywolf Press.